Check out watercolors beach, This is a brand new resort community, well thought out, and well planned, and nothing has been spared in it's construction. It too has been designed to be pretty pedestrian friendly, and has several small shops scattered around the neat business district. Check for vacation home rentals florida, and destin real estate. Book Watercolor Things To Do Online with TripShock.com! Watercolor is a new planned community. It was still under construction when the arial photo was made. It is near the end stages of development now. It is a very pretty and convenient beach side community. It even has it's own shopping center, complete with a Publix grocery store. There is one of the pretty coastal dune lakes inside the development, that contributes a lot toward fun things to do. 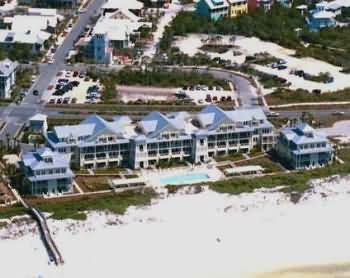 If you are looking for a destin beach condo or destin beach houses this is a good place to start. If you get bored it is about the same distance from destin or front beach road in panama city beach. There is a bit to see in the general area. You are just a short drive from Eden State gardens at Point Washington. They have an old mansion on the bay you can tour. On the way you will pass a state forest that has bike and hiking trails.